Having just about finished the first three books, last night I sat down to watch The Expanse series on Amazon Prime with my fiancée, only to see in the video feed that season three of The Grand Tour was already up to three episodes. How could I have missed it? So I watched that instead. Last I’d heard of the three stooges, they were getting tired of the same old formula and wanted to get rid of the tent and the interviews and the live audience so they could just focus on doing specials, which means this may be the last season of “normal” Top Gear — ahem, The Grand Tour — we’ll get. While season one kicked off in Portugal with the hypercar trinity comprised of the Porsche 918, McLaren P1 and LaFerrari, season three began in Detroit with the muscle car trinity. Clarkson spent a lot of time lamenting Detroit’s decline, particularly as the world’s home for true gearheads. So what better way to honor the memory of Detroit’s former glory than with three monstrously inefficient V8-powered American muscle cars? All three rival brands were represented: the Chevrolet Camaro, Ford Mustang, and Dodge Challenger. Only the Camaro had been tuned by Hennessey to make 1,000 horsepower and dubbed “The Exorcist,” the Mustang had the dealer-installed RTR (“Ready to Race”) performance package, and the Challenger…well, it was a Demon. The hosts proceeded to test the cars in all the ways that obviously mattered: Which was the fastest in a street drag race? Which made the most noise? And which was fastest in a makeshift race around an abandoned Detroit factory, where the corners were marked by cardboard cutouts bearing the faces of famous Detroit musicians? 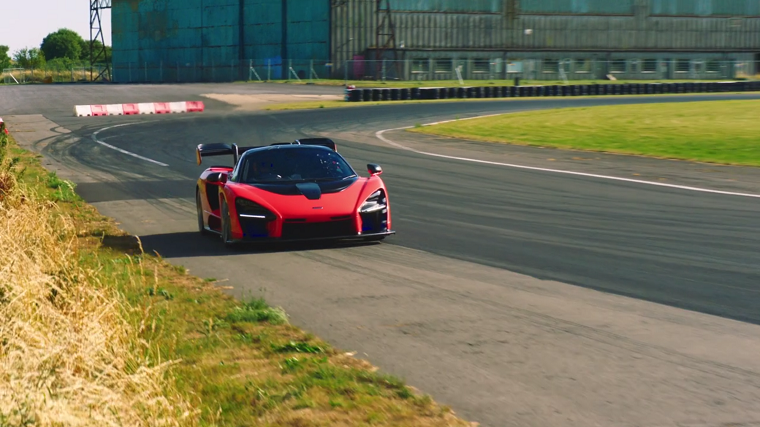 Before getting all of the results, however, Clarkson first reviewed the new McLaren Senna, behind the wheel of which Abby Eaton obliterated the Eboladrome track record, beating even the non-road-legal Aston Martin Vulcan. Back to the muscle cars: As it turned out, all three were the best at something. The Exorcist and the Demon were in a class of their own in a drag race, with the Demon marginally taking victory. The Exorcist was loudest and the Mustang RTR a close second. And while there was nothing between the Exorcist and the Demon around the makeshift race track, the Mustang RTR was by far the most capable. 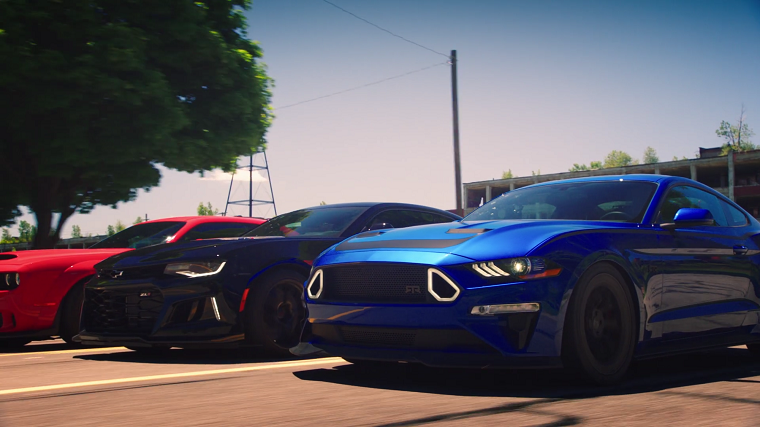 Though James May insisted to the audience that the Exorcist was the overall winner because true American muscle must be loud and undriveable, both Clarkson and Richard Hammond agreed the Mustang RTR would be the car they’d buy with their own money. 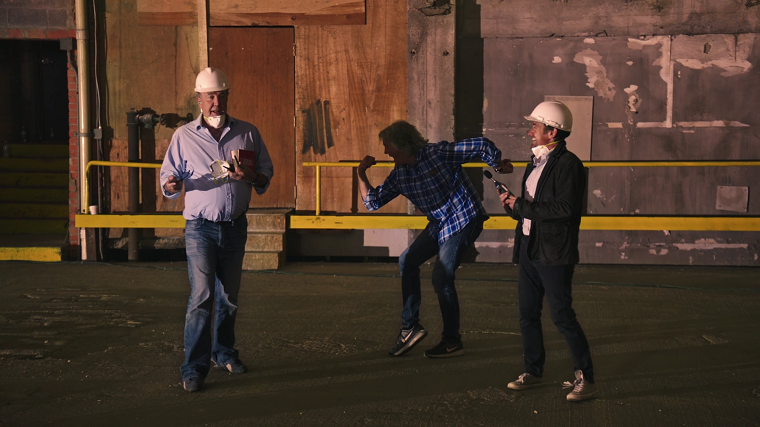 To make room for the Detroit feature, the episode skipped over the usual celebrity interview, and the next two episodes are a two-part special centering on the hosts’ adventures in Colombia, so already this season of The Grand Tour is a little unusual in its pacing. Ten more episodes will follow for a total of 13.